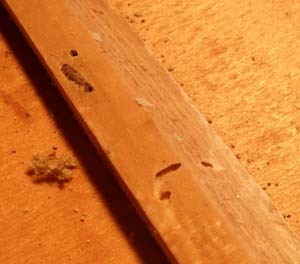 Upon closer inspection, I discovered that the house has woodworm. 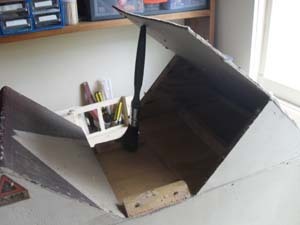 I could see holes in the base, but just to be on the safe side I thought I had better check the roof as I could see little holes in the cardboard. On removing the center roof panel I could see signs of woodworm. This meant the whole of the roof had to be removed, a job I had not intended to do. 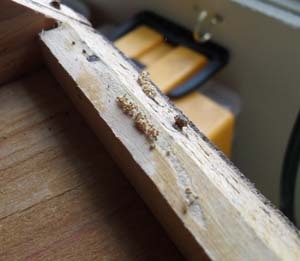 These pictures show the woodworm and how those nasty little grubs have tunneled there way into my dollshouse. These little grubs like damp soft wood, [I think this house has been kept in a damp place, as many of the metal window frames are very rusty behind.] and stay in plywood longer than any other wood. 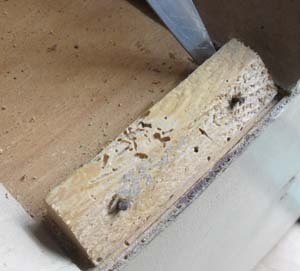 Once the house has been completely rubbed down I will treat it for woodworm, it is quite easy and just means painting the whole house with insecticide.